There’s nothing more dreamy than rocking up at the beach to be confronted by groomed peelers marching uniformly into shore, just begging you to paddle out and glide along a few glassy faces. In contrast there’s nothing more groan inducing than arriving to find mush burger central and white water everywhere. But should onshore conditions put the kibosh on your session and signal beer’o’clock? Or should you persevere? SUPM investigates. The term ‘onshore’ refers to the general wind direction. It’s derived from surfing terminology and used as a one word description to give insight to how wave conditions are at that current time. Breeze blowing directly on to the beach, or at a slight angle (cross onshore), will cause approaching swell tops to deform, crumble/collapse and break unevenly. How strong the actual wind is will determine how much white water is in effect. If the stars align then the opposite to onshore (offshore if you haven’t been paying attention!) is when you see wave heads salivating at the prospect with eyes glazed over. There’s only one thought here and that’s to do with scoring perfect waves! Unfortunately due to the UK’s erratic weather nothing is consistent, as far as Mother Nature goes. This is why you’ll find surfers pouring over weather (swell, wind and tide) data with fingers and toes crossed. When a decent looking chart pops up the scurrying of bodies to the beach can be heard far and wide. Army ants have nothing on the sounds of mass exodus wave riders pelting to the beach. After all, sometimes it can be prolonged periods of time between good sessions. In every instance, however, it pays to be prepared. After all, as we’ve already said, Momma Nature can sometimes be unpredictable with her moods. And with the best will in the world forecasters do get things wrong or not take into account local effects, such as summertime sea breezes for instance. As a surf rider it’s best to lay plans for less than ideal conditions and avoid those dreaded skunkings. Turn tail and pubward bound? So in the event of the wind turning onshore and your prized waves becoming blown out should you can things and head towards the nearest watering hole instead? Well, that depends on a number of factors. Firstly how windy is it? If there’s a gale howling onto the sand then it’s probably worth avoiding. At best you’ll be wallowing in the shallows (standing most likely) trying desperately to pick up and ride frothy waves that break erratically and not let your SUP be blown into the air. At worst you’ll be dumped back on the beach bedraggled. If it’s only gently puffing from the wrong direction then all may not be lost. It only takes a little bit of blow to make a wave crumble but this can increase the amount of whackable sections for those with skill and wave reading experience. If paddlers really have their shizzle nailed down then it’s actually light onshore winds which will help when trying to boost air, the breeze keeping boards glued to feet whilst flying skyward. Ultimately you’ll need to assess how the surf is and make a call depending on what you think the most likely outcome. Onshore winds, light or strong, also increase the amount of chop between sets. For newbie paddle surfers this can mean wobbling about between rides in discomfort. In contrast, however, any rider able to make use of onshore surf conditions will put themselves in good stead for when things clean up. After all if you can rip when it’s mushy then come golden hour you’ll be the stand out rider (or one of at least). If you’re thinking of tackling onshore surf then one thing you can do to make life easier is consider your gear – in particular your choice of board. 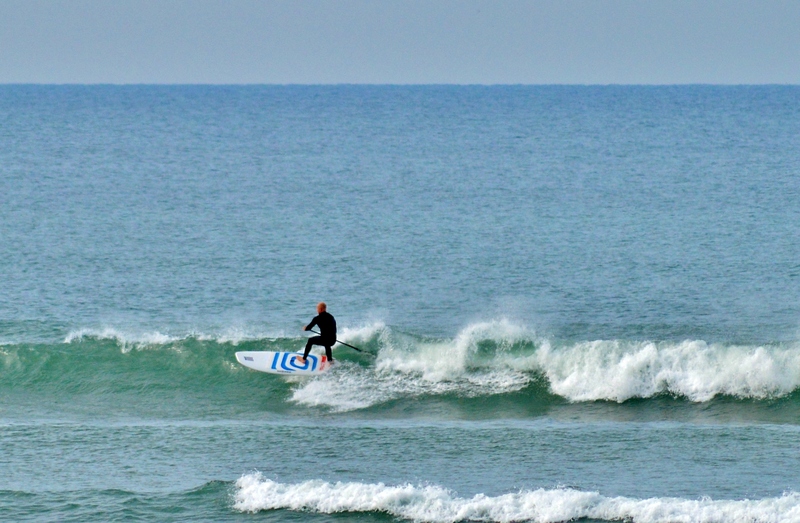 For most paddlers that high performance (small) surf SUP might not do you any favours with bumpy conditions on offer. If your session becomes a balancing contest then you’re definitely not going to be having fun. In this instance something slightly more buoyant with perhaps increased width will better suit. Although too much board and you’ll then struggle to turn efficiently and fit your stick into tight pockets between foam. It’s all trial and error with kit choices when talking onshore SUP surfing. In time you may develop the skills to ride your standard board in these tricky conditions as well as in idyllic wave environments. Best advice is to make your life as simple as possible though. With onshore winds, as we’ve already said, waves can become a crumbly mess. Something else to keep in mind is wind can also exacerbate any water flow or current. For instance if there’s movement along the beach, whereby riders can be dragged along the shore, it’s worth noting wind can make this worse. Proper assessment of conditions and then whether individual skill can cope should be given. Fatigue can also set in quicker when surfing blowy waves. Due to the increased chop and riders having to use their paddle more to keep position between rides exhaustion can become a factor quite quickly. Don’t underestimate the amount of extra work you’ll be doing when riding onshore waves. Ultimately onshore conditions don’t have to signal game over. If blows aren’t too strong, you have adequate skills and there’s a section of wave or two showing then why not still head out. This type of scenario can actually turn out quite fun and deliver a rewarding experience. Next time you’re dished up groomed corduroy you’ll be relishing the prospect further and find your riding/paddling has leapt on in leaps and bounds. Note: it’s perfectly applicable to surf inflatable stand up paddle boards in onshore conditions. It should be understood, however, that air filled boards sit on top of the water and are more susceptible to breeze. Therefore iSUP surf riders would be well advised to consider if they and their equipment can cope with the conditions on offer.